How Do I Download the Hebrew Bible Sound File Installer for BibleWorks 10 Revision 1? BibleWorks 10 Revision 2 and later flash drives and download files come with Hebrew audio files for the entire Bible. The revision number is printed, after "BW10r", on the outside of the BibleWorks 10 USB, so that "BW10r1" is Revision 1; downloads since January 25, 2016 will have been Revision 2. BibleWorks 10 Revision 1 flash drive and download customers can obtain a free update of the Hebrew Sound Files by following the steps below. All other updates included in Revision 2 and later are available by BibleWorks Update. 1. Download the Hebrew Bible Sound File installer for BibleWorks 10 Rev. 1. This is a 2GB file, so please use a fast and stable internet connection to download the file. A download manager can assist your computer in downloading large files and we recommend using one if the file does not fully download resulting in the installer not working. We recommend using one of the many free download managers for PCs or for Macs. 2.1 Windows users: Run the installer and follow the on-screen instructions. c) Browse to the downloaded file and run it. 3. When the installer is done, run BibleWorks 10. The Hebrew Bible sound files should now be available when you right-click on Hebrew OT or NT text in the Browse Window and select "Open Hebrew OT/NT Audio Player." 4. 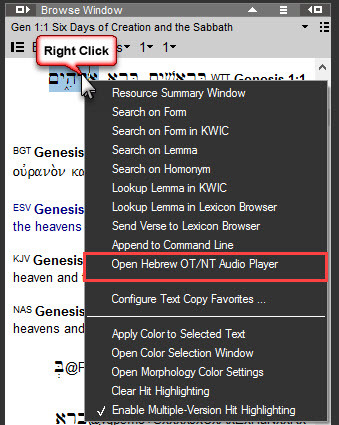 If the "Open Hebrew OT/NT Audio Player" option is not available after step 3, please update the BibleWorks Executable update using the instructions here. Does BibleWorks Include Audio Readings of Bible Texts?